During World War I, the Royal Navy blockaded Germany’s North Sea ports and cut off all imports into the country. Desperate for imports of rubber, tin, nickel and other resources unavailable within their borders, the German merchant marine took a page from Jules Verne’s 20,000 Leagues Under the Sea and developed blockade running merchant submarines. The subs were built for the North German Lloyd Line and were designed to maximize cargo carrying capacity – unusual for vessels normally viewed as tools of war and not of trade. The first sub, Deutschland, made her maiden voyage in June of 1916 and arrived in Baltimore, Maryland a month later carrying dyes, gemstones and pharmaceuticals. Deutschland had successfully threaded the needle of the Royal Navy blockade without even being detected. Returning with a load of valuable nickel, tin and rubber, the Deutschland’s maiden voyage not only paid for itself, but it netted a massive profit for her North German Lloyd Line owners. 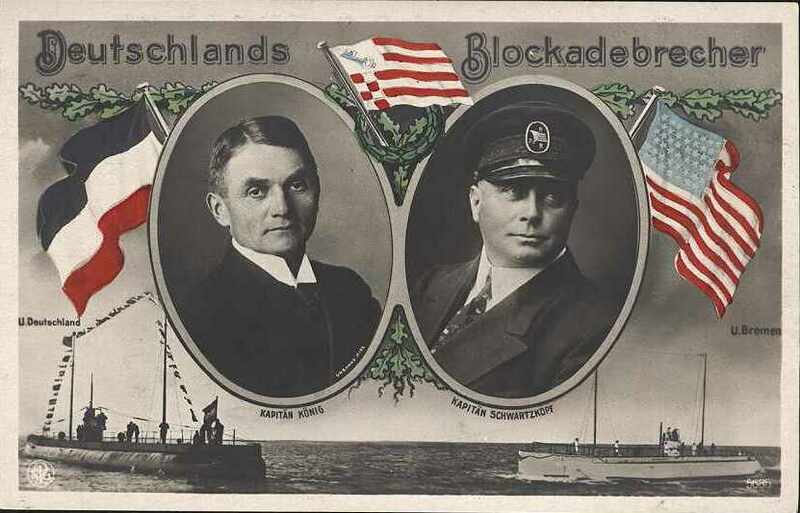 The Deutschland made one more voyage to the United States before deteriorating relations between the US and Germany precluded further trade. Deutschland was later converted to u-boat use by the Imperial German Navy, sank 42 vessels and was turned over to the Royal Navy after the Armistice. The Deutschland’s sister ship, Bremen, sailed for the US in September of 1916, however, she never arrived and was presumed lost at sea. One of Bremen’s oil stained life preservers was discovered near Cape Elizabeth, Maine indicating the ship may have made its way as far the American coast. The ship’s disappearance, though, remains a mystery. Various reports indicate she might have been depth charged or mined by Royal Navy vessels, but perhaps Bremen felt drawn to her Jules Verne origins and fell prey, like Captain Nemo and the Nautilus, to the Moskstraumen.